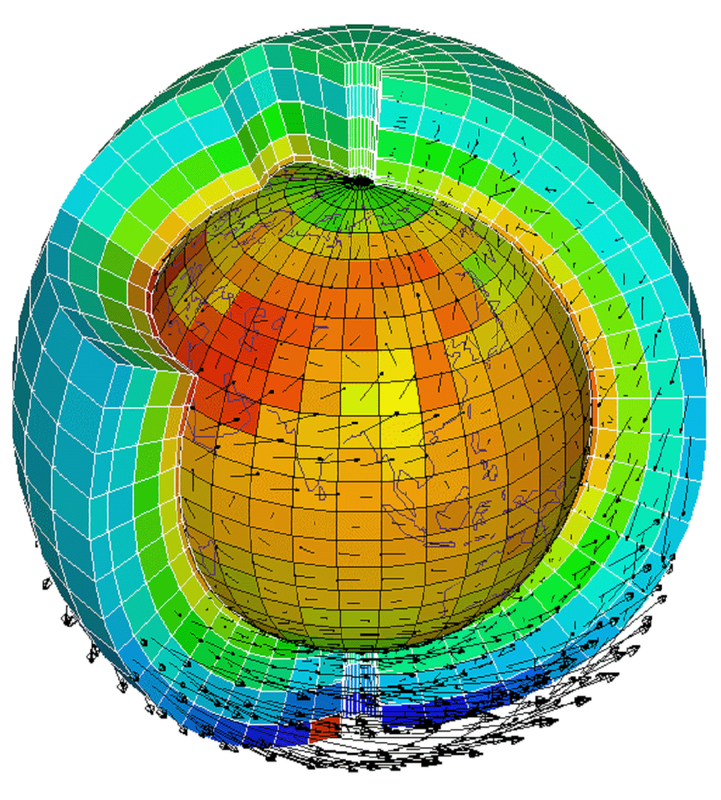 Numerical simulation (modelling) is a major specialty of the LSCE since it was created. Initially, modelling approach was conducted by paleoclimatologists (thematic: Arcives and tracers), who investigate relatively long periods of time (from hundred to several hundred of millions years), and also by biogeochemists (thematic Biogeochemical cycles et Transfers in the Environment) dealing with shorter timescales. Since 2010, climate modellers are gathered in a single thematic group. They work on interactions between climate and cycles, and investigate various periods of time. Modelling researches are closely connected to observations activities conducted at the LSCE, for reconstructing past climates, as well as for monitoring atmospheric composition and fluxes between the atmosphere and land and ocean surfaces. The different teams of this research activity are located at the LSCE-Orme des Merisiers. They focus on the climate variability and the interactions between the different components of the Earth system (MERMAID), on the climate dynamics at various timescales (CLIM), on the model computing infrasctuctures (CALCULS), and on the statistical methods for studying the variability of the climate and downcaling techniques (ESTIMR). - Modelling of the impacts of the anthopic forcing on "breaking points" of the climatic system (thermohaline circualtion, monsoons, permafrost, Methane hydrates..). - Integration of the model evolutions and mass computation facilities. Improvements of the different components are also focussed on ice caps (modèle GRISLI), continental surfaces (ORCHIDEE), marine biogeochemistry (PISCES), aerosols and atmospheric chemistry (INCA). In addition, LSCE expertise in tracers et isotopes measurements is reinforced by the introduction in the Earth system model of the water and carbon isotopes, to better understand the biogeochimical cycles.